Hubby and I took our very first outside-the-U.S. trip (not counting our little forays into Mexican border towns—those don’t count). We spent a week in London and 2 ½ weeks in Northern Ireland and the Republic of Ireland. The trip took care of several items on my bucket list. When we went to New York City several years ago, I was shocked by the unpleasant stench of the place. Central Park smelled like a giant outhouse due to all the homeless living there, I assumed, and all the dogs who did their business there. I suppose the park is considered prime property because it has grass and trees, rare things in a city that big. That city has too many people, pets, and transportation in too small of a space. And the noise. Along with people noise and the roar of transportation (cars, busses, and subway), a constant chorus of honking car horns on the streets resounded above all. I expected London to be the same way as New York, but I was wrong. The air was clean and the streets were mostly neat. And we heard a car horn just once or twice in a week. People were polite, both on the street and in their cars. We felt safe walking the streets, but generally stayed where there were a lot of people around. In other words, we really liked London! Princess Charlotte was born while we were there, about two blocks from where our hotel was. She went home to Kensington Palace which was about half-mile in the other direction. In spite of being so close to all the excitement, we never saw a thing, but took a selfie in front of the hospital. Age and history permeate everything. Most structures are constructed of stone, a very durable material. Castles built by the Normans in the eleventh century still stand. Houses built many centuries before are still occupied and are being refurbished for living in. Gardens are everywhere and beautifully maintained. It was a pleasure to see it all. As with any large city, there’s a lot to see and do. I had my list of things that I really wanted to see and pretty much kept to it. Hubby had his list of geocaches and he pretty much kept to it. Fortunately, our priorities all blended together. My favorite places were the British Museum and the Tower of London (both bucket list places). The museum houses so many trophies from all over the ancient world. If truth be told, English archaeologists looted many of the famous sites a century ago and carried the artifacts back to the museum. It’s sad to think of until we remember that ISIS is blowing up sites where some of the artifacts originated. If not for the museum, all would be lost. The London Zoo was unusual in that several exhibits allowed visitors to walk among the animals. The non-threatening ones like monkeys, sloths, birds, and lemurs. No touching allowed though, but you’re closer than you’ve ever been. After my visit there, my allergies kicked up so I’ve determined that I’m allergic to monkeys, sloths, birds, and lemurs. We look a side trip to visit Stonehenge, Salisbury, and Bath. Stonehenge is awesome to see. I didn’t feel any strange power emanating or anything. Guess I’m no Druid. Salisbury is a small town with an enormous cathedral in town that is surrounded by a wall. Both were built in the early twelfth century. The skill of those workmen so long ago was a tribute to their abilities. The architecture was amazing. 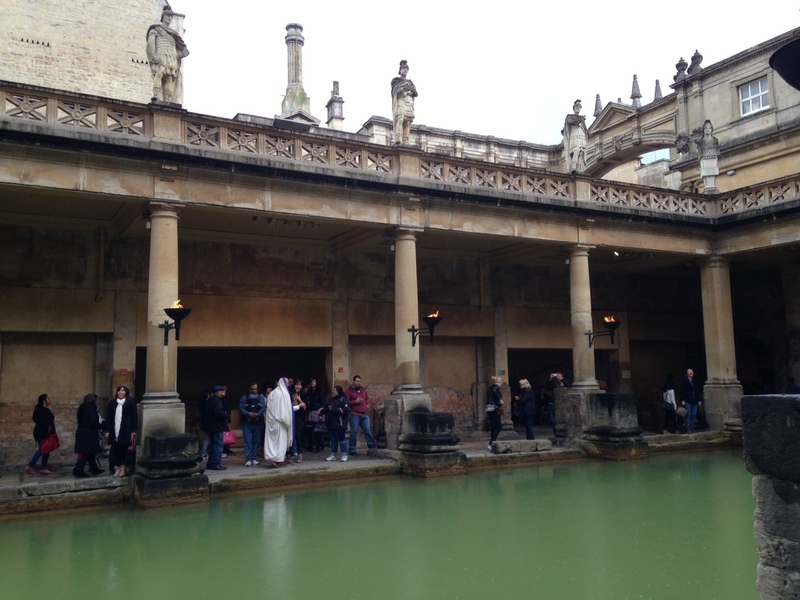 In Bath, we visited the Roman baths built over 2,000 years ago. Enough of them was left to see the crafts and skills of those who worked on it, likely slaves. The engineering of the pools was very complex and excited Hubby to see. The Roman hot springs pool at Bath, England, built around 500 B.C. It’s hard to describe sights and sounds of London. It’s another world.